So do you want to become an internet marketing expert? Maybe the better question is: do you want to close sales? You can have all the knowledge in the world about internet marketing, but if your landing pages aren’t “sales closing machines,” then what good is all that knowledge? The best internet marketers create simple but solid landing pages that convert suspects into buyers (B2C) or into leads (B2B). And the best internet marketers create slightly different versions of their must successful landing pages, test both versions, and see which converts better. Because closing more sales isn’t about being an internet marketing expert – it’s about conversions. But it doesn’t have to be complicated to get started – or to be effective. You just have to know a few basic things. Internet marketing experts will tell you they know all about the rules of compelling content, what drives conversions, and why you need to use a red button instead of a green button. But real results defy logic. In a study done by Paras Chopra on Copyblogger.com, readers were asked to guess which calls-to-action converted better. When I tried the test I got nothing right. The split tests conducted using a professional split-testing tool produced completely different results. This is probably the most important item since it is what gets the rest of your landing page read. If you get this one wrong, nobody will visit the rest of your page, and you’ll have nothing more to test. If you’re driving for opt-in email subscriptions, or direct sales, you need call-to-action elements, such as buttons or conversion forms. Test for placement of call-to-action items, text and colors. How do you describe your product or service? Who is it for? What images are you using? Play around with different benefits to see what appeals to your audience. You might think one set of benefits appeals more to your prospects, but an entirely different set of benefits might appeal to them. Will long or short copy convert better? Most people think short copy converts better. But many times long copy drives more conversions. Test for long copy vs. short copy. Are your customers primarily visual or text-driven? Don’t know? Test for it. They don’t stay with their tests long enough to get statistically significant results. They want to test too many things. They’re not tracking their tests. Your goal is to convert visitors to prospects to leads, or leads to sales. Whatever your landing page goal is, test for it. Don’t test for anything else. Let your tests run until you have a 95% confidence level. 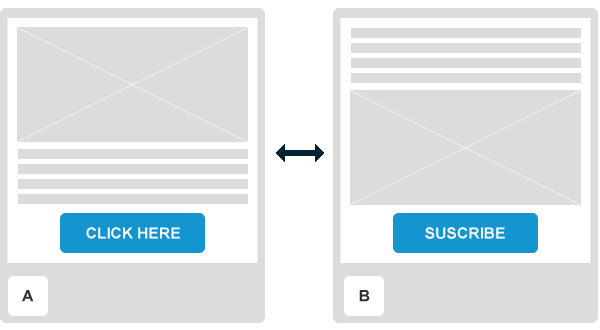 Don’t stop your split-test just because you feel one page is converting better than the other. The surest way to muddy the results of a test is to test for too many elements at one time. Be very clear which change on your landing page caused which change in visitor behavior. Testing one item at a time will help you do that. Measure your results. Sounds logical, but too many marketers don’t measure their results. Instead, they perceive that one test is doing better than the other. Also, track your tests. Document what works and what doesn’t. Build up a knowledge base of best practices. And real results defy logic. Click here to find out more about how easy it is to conduct an A/B split-test using Lander, and become the internet marketer who actually closes sales and beats the experts!